Last workday we managed to get most of the HQ deck finished, so steps were the next "step"! Terry Bledsoe led the team, with Lynn doing a lot of the actual work with help from Terry, Al, and Dave Miller. And Bessie the shop dog and Jerry Lee (aka "The Killer"). The dogs seemed to be the ones with the common sense in that they stayed in the shade a great deal of the time!! But at the end of the day the stairs were complete, aside froma little railing work. HQ still needs electrical and water / sewage lines run to it. Roger recruited the Whitakers to work on the Model T racers - though I think they spent nearly all their time on the Blue Devil vehicle. I could be mistaken about that though. They also spent some time further refining the Maytag Motorbike Runabout. 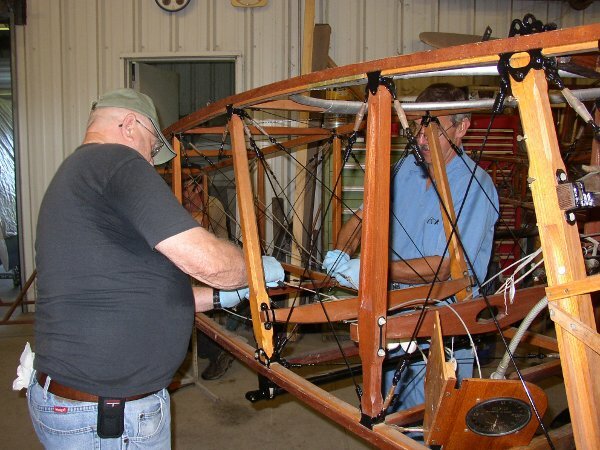 Tom Miller had spent three days at Kingsbury varnishing the wood on the T-2 fuselage and starting to paint the metal fittings with Rustoleum black enamel paint. Tom got a heck of a lot accomplished!! So various people tried to finish the detail painting on the fittings but we failed to finish the project. I will say the smartest (and one of the more patient) of the folks working on it was Greg Solberg who crafted a paper template to allow painting of the fitting "tulips" without slopping paint on the wooden parts! Don Larson and Ernest ??? spent part of their time making sure all the fuselage turnbuckles were properly safetywired. They did finish that part! Dave Orloff and a few other helpers who drifted in and out worked on stripping the T-1 fuselage so that in-depth cleaning could take place. The engine was hoisted out and placed on a stand. The cockpit was stripped to provide adequate access to the fuselage structure. Lastly, Rom Marcotte with some help from Ernest worked on the belly formers for T-1. A few puzzlements reared their ugly heads and I'm not sure Ron got them all sorted before it was time to leave for the day! Art has been working on the Meyers, and has been making slow, but visible progress. The prop for the Meyers had returned from refurb and looked gorgeous!